Made of high quality material, durable and comfortable to wear. Wearing this gorgeous mask will give a stunning and lasting impression of a life time at any events you attend. 1. Made of durable materials£¬the mask material adopt pu leather, the lens adopt plexiglass, rivet adopt metal material£¬the color is red. 2. The humanized design of the opening of the mask can be perfect for the wearer's face, and increase the comfort of the wearer. 3. The design of large lens, not only show the punk characteristics of the product, but also ensure that the wearer's vision will not be too affected. 4. Mask length in 32cm (not including the belt), mask and backband can go to 53cm, height 27cm mask on both sides, width of 26cm, horizontal with adjustable length in the 49cm, vertical with adjustable At 30cm. 5. 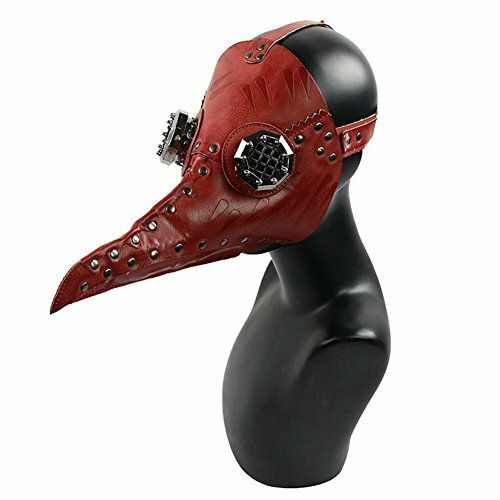 Full face punk plague bird mask, used for masquerade party, christams, halloween, costume party, punk party and so on.